by Carolyn Whiting (nee Howe), June 2006. Do you remember the corner grocery shops? Carolyn Whiting does and printed below are some of her memories. 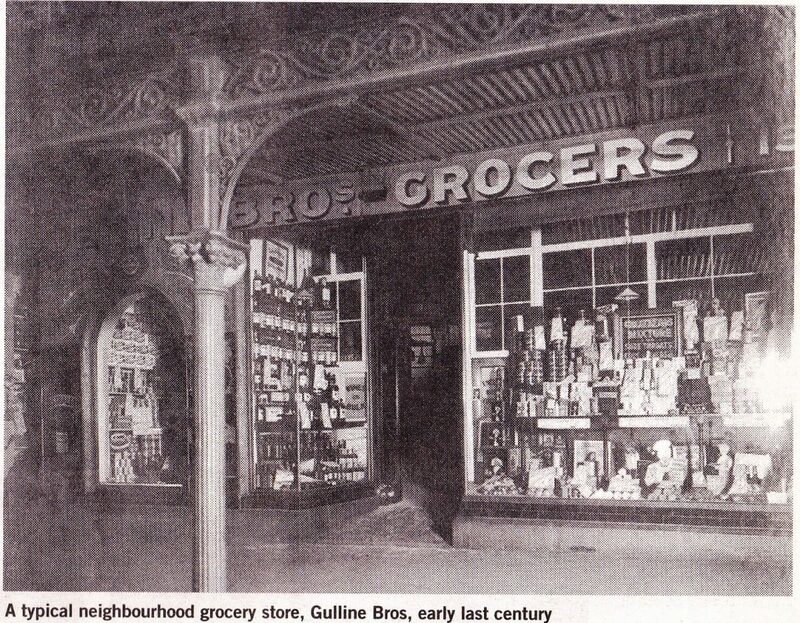 In the days before the large supermarkets, people would shop at the local grocer's shop. A wonderful blend of aromas greeted them when they walked through the door. The sugar and flour were stored in large sacks and tea was loose in chests of the type still widely sought after today for those moving house. Mixed dried fruits and spices were kept in deep wooden drawers, waiting to be weighed and packaged, as customers could order as little or as much as they wanted. The butter and cheese sat on a slab of marble with a muslin cover for protection, whilst nearby were pieces of bacon and ham ready to be sliced. Biscuits, both sweet and dry, were stored in large tins and you could buy or sometimes were given the broken pieces from the bottom of the tin. Eggs could be bought individually with each one being carefully wrapped and placed in a paper bag. Families were able to buy 'on tick' This meant having an account with the shopkeeper which was usually settled on payday (whenever that might be). The grocer would know all his customers well and would engage them in long conversations about the health of their families and such. A chair was placed near the counter so that customers could sit and chat whilst their order was being prepared.